Sausage and chicken gumbo has soul-satisfying flavor. Green Springs Bistro, reflecting the original 1800’s name for the Safety Harbor area, is also an original. Owners Kris Kubik and chef Paul Kapsalis have a close connection to patrons. They know their guests’ names. They know what their customers eat. They know where their customers’ kids went to school. They probably could name the roles their children performed in school plays. Such is the charm of this Cheers-like, cozy bistro housed in a 30s cottage off the main drag. The storybook setting boasts a cheery hearth, bright walls, vibrant murals, stained glass and work by local artists. The chef’s repertoire includes Gulf coast recipes for steak, shellfish, and other Florida catch. “Fresh seafood always excites me because it was so important to me during my formable years growing up on Clearwater Beach,’’ says Paul. He is a Culinary Institute of America-trained chef, with a Greek mother and grandmother, both of whom taught him more than a few tricks in the kitchen. He remembers riding around in the back seat of their cars to ferret the best from butcher and baker for a family feast. He is nostalgic for the Old Florida produce stands, brimming with regional favorites. His Mediterranean heritage shows up such treats as the bruschetta-like, beneli, made with feta cheese, roma tomatoes and Portobello mushrooms. It’s the chef’s take on the pizza-like dish he discovered in a remote village in the Greek mountains. Pleasantly-seasoned, lemon-kissed saganaki — the flaming kefalograviera Greek cheese starter — sizzles in an individual skillet, just waiting to be sopped up with the tasty bread. A spinach enchilada, wrapped with a sharp Vermont cheddar blanket, is doused with a spicy chile Colorado sauce. The chef is happy with the number of guests who return for his seafood. “It makes me happy that I can bring in more and more favorites,’’ he adds. A shrimp and sausage creamy grits order nearly made me lick the plate. An herb mayonnaise adds zest to sesame-crusted mahi-mahi. A delicate risotto sings with fresh shrimp and scallops. The soups are good, too. 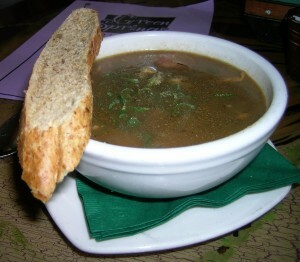 A sprightly sausage and chicken gumbo has a soul-satisfying mahogany roux. Kris takes advantage of local berries to christen Black ‘n Blue cobbler, an excellent finale. Seasonal peaches or apples find their way into cobblers, too. Green Spring’s wine list is carefully selected. “We spend lots of time tasting wines because we can’t store hundreds of bottles here. It’s no secret, this is where we try to make our money,’’ adds Paul. “We are extremely consistent about food quality,’’ says the chef who says a memorable dining experience must also include great wine and service. Considering the good natured and courteous staff, it’s easy to understand why the restaurant has a loyal following. Some of the staff has been there all 11 years while local acoustic guitarist/songwriter Michael Rusch has also been entertaining patrons since Day One. “He’s really diverse and can mix it up so we can listen to him five nights a week,’’ adds Paul. Considering the average Florida marriage doesn’t last 11 years, that’s quite an accomplishment. Hours: Lunch: 11:30 a.m. to 2:30 p.m., Tuesday through Saturday; dinner: 5:30 to 9:30 p.m. Tuesday through Saturday. Deals for Dad: Treat your father to Fleming’s Prime Steakhouse and he receives a $25 dining card Sunday. They offer a three-course brunch menu and the regular menu. Father’s Day at Byblos can be attractive, too. Dads receive a free entree of their choice (limit one per table) from noon until 9 pm. Visit the Byblos website or call (813) 805-7977. Hop on down: Hoptomic Bitter Beer Festival may be just what Dad ordered. Tampa’s Straz Center for the Performing Arts turns into a beer-centric tasting with pale ales, amber ales, IPAs, barley wine along with food samplings from Ella’s Folk Art Cafe, the Independent and Mr. Dunderbak’s. The event from 2 to 6 p.m., June 18, costs $58.50, which includes a tasting glass. For more info, call (813) 229-7827 or check their website. Opening in September: Pete’s Wood Fired Pizza will fire up ovens in the former Mercantile Bank. Sounds fabulous, I have some friends who call this their very favorite restaurant, you have confirmed their opinion!